All about MAC "It's a Strike Collection"- Perfect Score Lipstick is Looove! | LIPS n BERRIES! 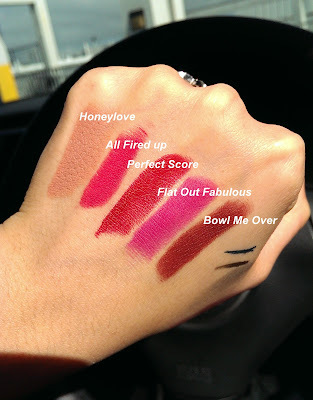 All about MAC "It's a Strike Collection"- Perfect Score Lipstick is Looove! "Varsity-chic hues to bowl you over" is the tagline of this collection. A collection of pinks, reds & greens, inspired by the colors of a neon lit bowling place. 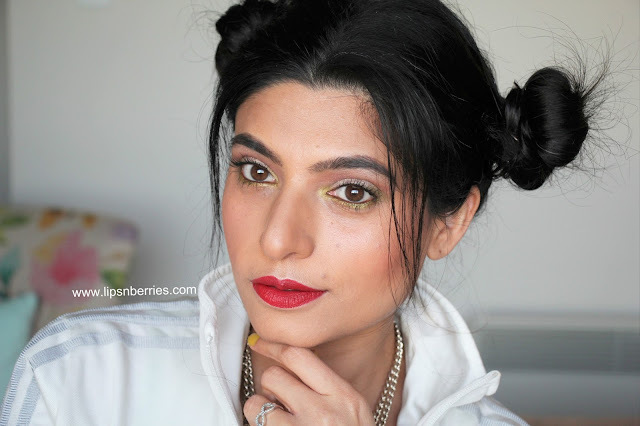 I thought long and hard about the look to go with this latest fun collection from MAC (Read 5 minutes coz there is never any thought behind my looks! I believe in going freehand). It had to be something equally fun, carefree & bowling appropriate. I can surely do better at bowling inspired makeup than in the alley where I'm pretty hopeless. I once scored the lowest! It's all in the technique I was told. Nevermind! MAC "It's a Strike" Collection is now available in MAC stores near you (Sept-Oct 2016). -7 Lipsticks - Honeylove (Permanent), All Fired Up (Permanent, my favorite lipstick), Flat out Fabulous (Permanent, my second love! ), Perfect Score (New found love! ), Bowl me Over (Online Exclusive), Liquid Lurex (re-promote), Babes and Balls. - 5 Creemsheen Lipglasses- It's a Strike, King Pin, Throw a Spare, Right up my Alley, Spare Me. - 2 makeup brushes - 116 Blush Brush & 213 Fluff Brush. 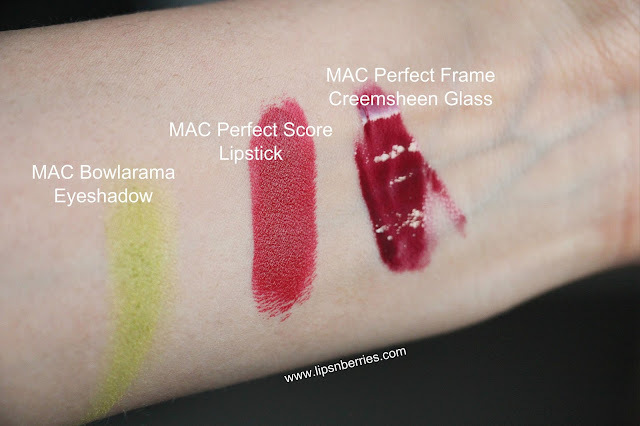 I went to MAC St Lukes store to check out this collection and here's the swatches of other lipsticks and Creemsheen lipglasses from this Collection. Lip products are a highlight for me in this limited edition collection! 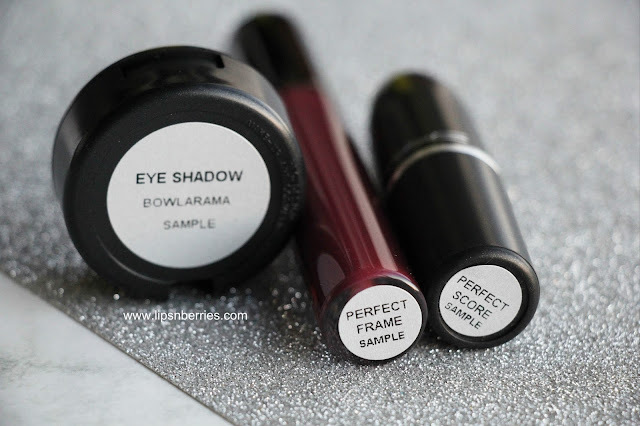 I received 3 products from this collection a few weeks ago- It's a Score lipstick*, Perfect Frame Creemsheen Glass* & Bowlrama Eyeshadow* and here's my look featuring 2 of them. Perfect Frame Creemsheen glass was not used in this look. This is my first time trying out centre part hair and it surely felt funny & awkward. Oh well! Life's too short for boring hair (Look who's saying!). 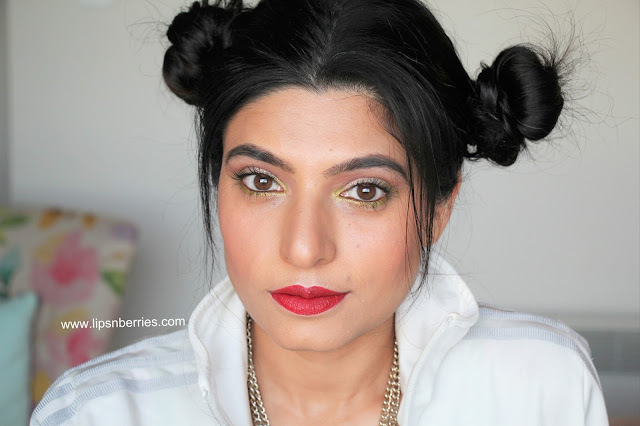 Hope you enjoy this look. 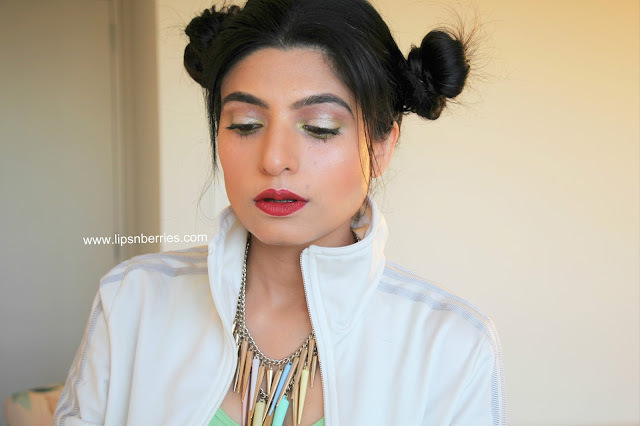 For the makeup, I did a shimmery neutral eye with a pop of green with Bowlrama eyeshadow on the lower lash line. 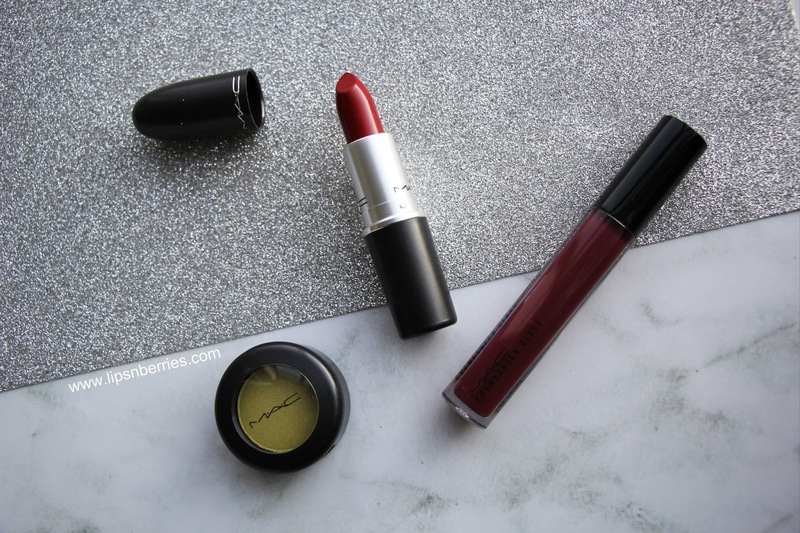 The lips are graced with my new favorite lipstick.- MAC Perfect Score. I actually hit the strike with this one. 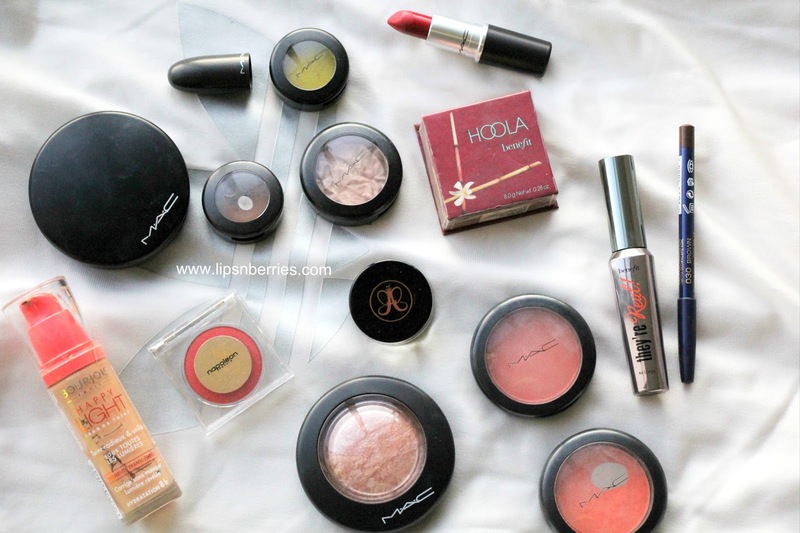 So pigmented, hella stunning and matte. Yes! 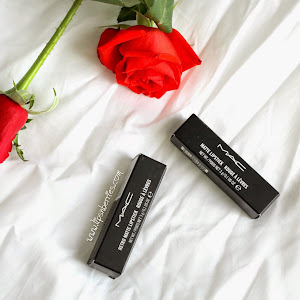 my favorite finish from MAC. It doesn't bleed, it doesn't disappear. It just stays on & on. 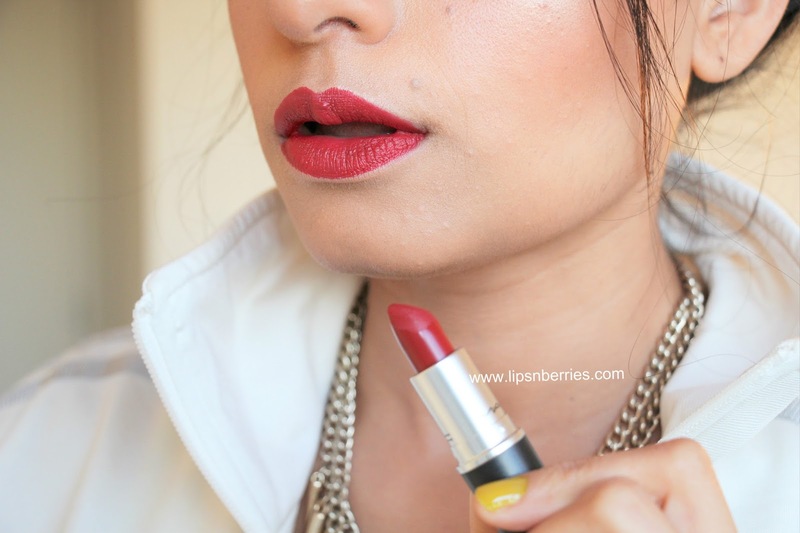 Its a perfect shade of red too- a very sophisticated deep red that complements warm skin tone so beautifully. I'm in awe. 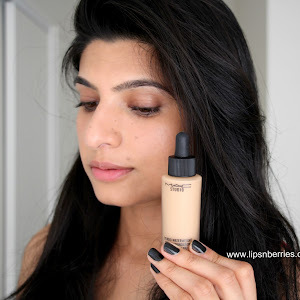 If there's one product you should check out from this collection, this is the one! 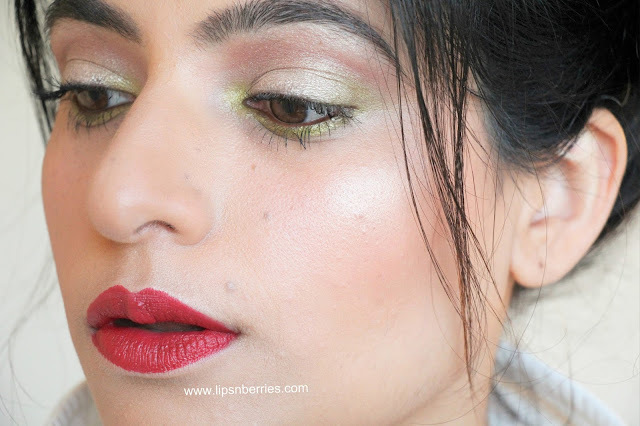 I'm not too much of a fan of lip glasses so I haven't used Creemsheen Lipglass in 'Perfect Frame' in the look. 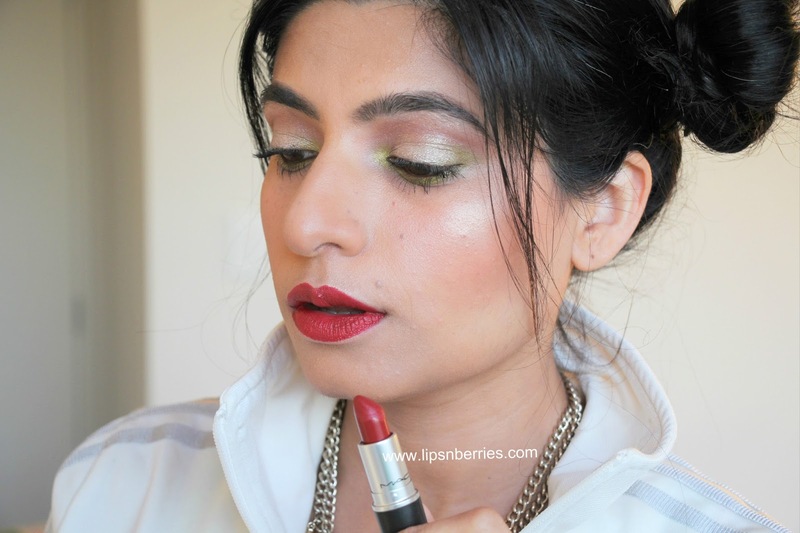 To be honest, I didn't want to spoil the look of red lipstick. I have already posted a picture with this gloss on my insta story few weeks ago (which disappeared in 24 hours!) so I'll post another one soon on my Instagram feed. It's a pretty burgundy shade nevertheless. 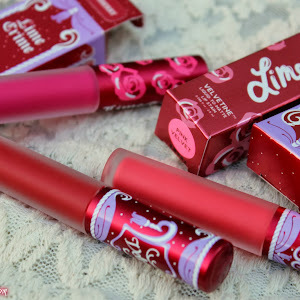 The Creemsheen lip glasses are quite pigmented, glossy and super moisturizing. You can use them on days when you want some color but not the opacity. 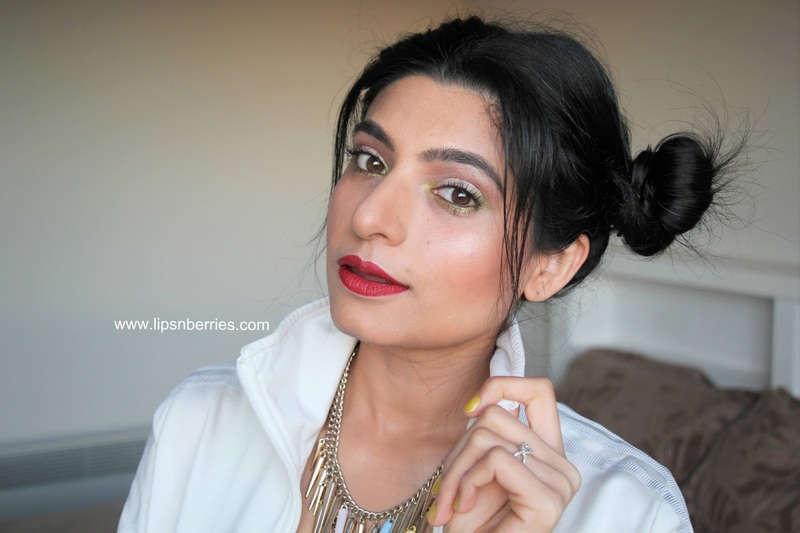 The Bowlrama eyeshadow is a shimmery lime green eyeshadow. It isn't crazy pigmented so you'll have to layer it up a bit. I'm quite tempted to try it out as lid color next time. I've been doing too many green/blue eye looks so refrained from painting myself with Bowlrama this time. I think it looks pretty subtle yet eye catching in my lower lash line. 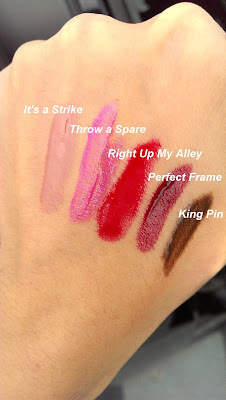 MAC It's a Strike is in stores now. 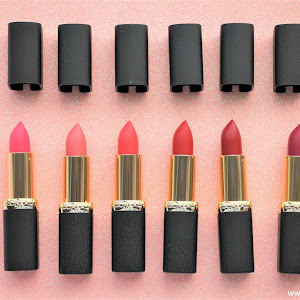 Make sure you swatch the lip products and especially the lipsticks in this collection. 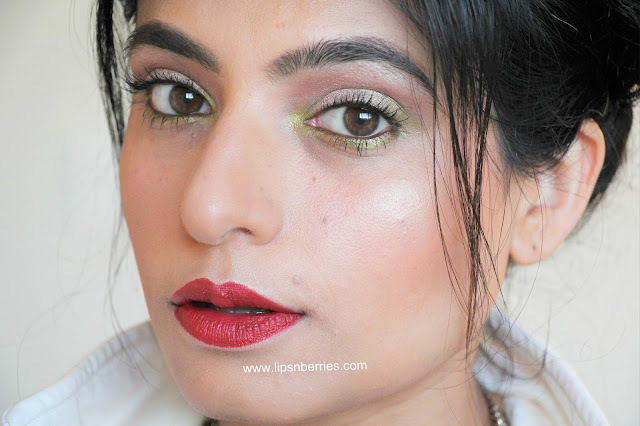 I'm quite keen on trying the lipstick Honeylove that was suggested to me by a reader few days ago. Apparently it's a perfect n*de shade. Permanent too! Would you be picking up anything from this collection? Anything that catches your fancy? 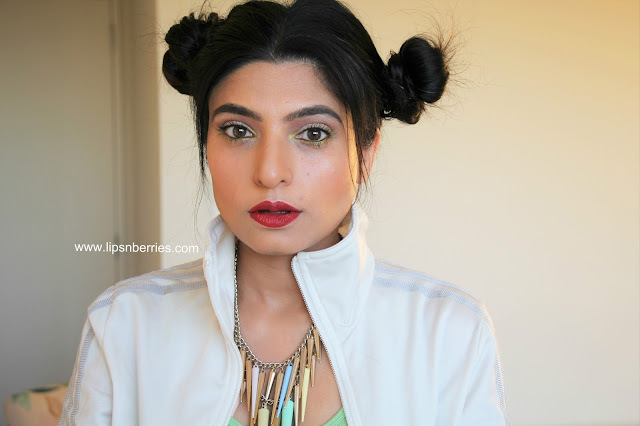 Did you like the look I created? Tell me I look like a cow in the comments below! P.S. 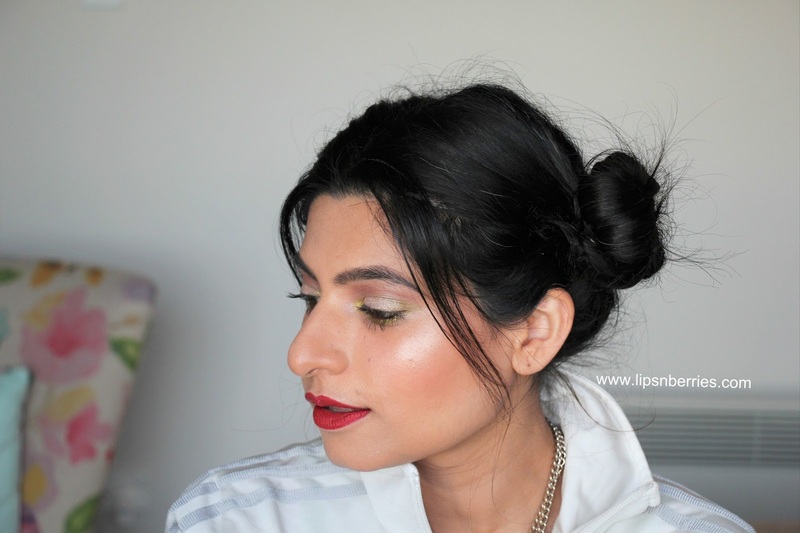 Makeup used in the look. Comment below if you need specific details about any product. All about MAC Good Luck Trolls Collection!